Hey Richard, is this car a Holden? It reminds me of the Holden-based Pontiacs that were available in the US for a while. Yes, Jer, that is a Holden. 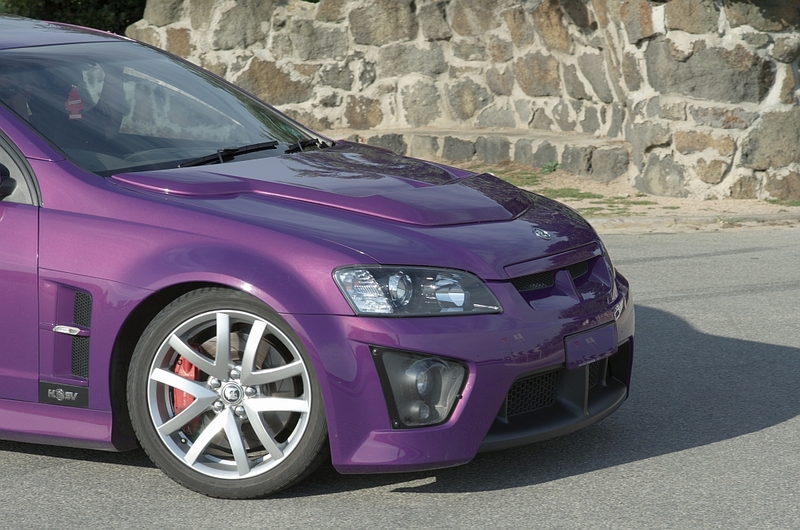 A Holden Clubsport - commonly known as a Clubbie. My daughter had one for a while but they are expensive to feed and maintain. Richard and Ray - is this car based on the Zeta platform? Yeah, Richard, I'm not hot on the color either and could do without the boy racer do-dad on the hood, but with the LS2 mill, this thing's got the juice, for sure. Jer, as far as I know, it's the Zeta platform. I saw a recent announcement that the next model Commodore will still be using Zeta. But that was in the press, so it could be a lazy regurgitation of a company press release, someone's wild-assed guess or somewhere in between. Purple is a popular colour with some ethnic groups and the topic of good-natured banter. It tends to go along with danglies hanging from the rear-view mirror (note the pine tree deodorant). In the good old days it was purple Valiants with dice danglies. And. yes, they go That one was 307KW/411HP. The current ones are cranking out around 317KW. They are/were sold in the UK as the Vauxhall VXR8 and there's probabaly a YouTube video around of Jeremy Clarkson driving one sideways. Yup. I don't have much to offer in the photography side, but in America that car is available as the Pontiac G8 GT. Richard, thanks for continuing to educate me on the automotive scene in your neck of the woods. I find everything about cars - the products themselves, the culture, the characters and the manufacturers - to be truly interesting. I think you're right; I'm pretty sure the G8 was based on the Zeta platform and it certainly looks like the car in Richard's photos. Alas, like the Pontiac division, the G8 is no more, but I'm sure you can get your hands on a used one (there may even be a few untitled new ones around here and there). I dimly remember reading something about GM producing a version of the G8 as a Chevy to be marketed to police departments - in fact, they may already be in production. Also, I believe the current Camaro is based on a version of the Zeta platform, which would account for its considerable size and weight. No worries, Jer. The G8 was based on the Holden Commodore. Apart from a few cosmetic changes to make it look more Pontiaic, it was almost identical in appearance. There were a few changes for the US market such as, I think, moving the fuel tank and changing the interior to match US expectations. It was made in South Australia. The car in my photos was also based on the Holden Commodore. The Chevrolet Caprice police car is based on the Holden Caprice, which is a long wheelbase Zeta platform vehicle. Holden Special Vehicles also has a couple of LWB cars with the hot engine, suspension, brake, etc. improvements.